Football Dartboards are one of our most popular items and we now offer them in two different sizes - the massive 27ft tall version and then a smaller, but still large 14ft tall version. In the photo above is our massive Football Dartboard game and it can be seen in use in a video below. This giant football darts measures a huge 28ft wide and is almost as tall - it really is huge and makes for the most imposing attraction you can get. If you don't have the space or height clearance for this massive version please scroll down the page to see our smaller 14ft version. A traditional game of darts would take too long for most events so the usual method of play is that each player has three shots at the board and the score from each successfully stuck ball is totalled up. This game comes complete with staff to ensure its safe use. Have we said this game is massive? Well it really is and the above version requires a minimum operating area of 60x60x30ft. 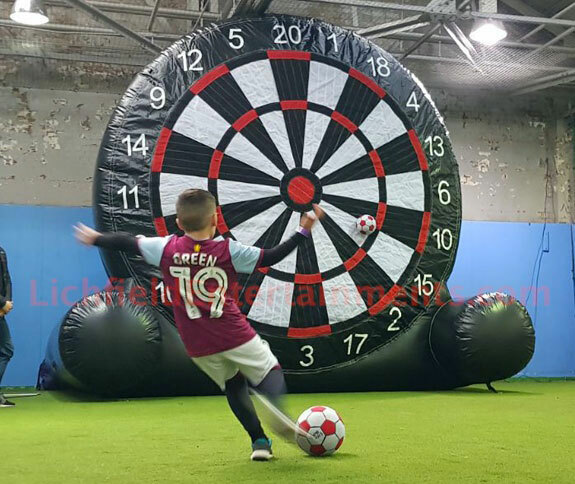 If the huge football darts above is too large for the space you have available then we also offer a smaller, but still large, 14ft tall version of the game. For this version you will need a minimum operating area of 30x18ft with a height clearance of 15ft. If football isn't your game then the same massive dartboard can also be used as a Giant Tennis Dartboard where people strike normal tennis balls at the giant dartboard with tennis rackets. This makes a fantastic and unique attraction for tennis club open days, tennis tournaments, etc. If you have any queries, questions, or would like to book the giant Football Darts or giant Tennis Darts please click here to enquire and we will do all we can to help. 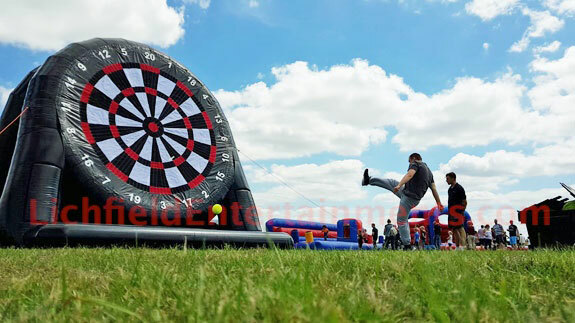 Other great football themed attractions to hire alongside the football darts include Footpool, Human Table Football, Rodeo Football, Penalty Shootouts and Speed Cages.